Recently someone left a comment on my website asking how to specify the position of an image precisely. Setting the position of an image is easy — what’s hard is finding the setting! The most common reason I want to specify the position of an image using a measurement is so that objects on adjacent slides are in the same place; otherwise, they appear to jump as you move from slide to slide. Even the slightest difference in position becomes clear in this situation. Usually I eyeball the position of an object on one slide and then want to match that position on other slides. Once you have an object in the desired position on one slide, you can copy and paste it to another slide and PowerPoint will put the copy in the exact same position on the new slide. This is often a great solution. But when the two objects aren’t exactly the same, the situation gets muddled. On the right you see 2 slides that are similar. but the callout shapes are different sizes because the quotes inside them are of different lengths. Once you put in the quote and start adjusting the callout shape’s size, it’s easy to lose your positioning. In these situations, you’ll want to position a shape or image more precisely. You can get good results by using the ruler. If it isn’t displayed, choose View and check the Ruler check box. As you drag an object, you can see a line on the horizontal and vertical rulers, indicating the object’s position. The problem with this solution is that the line is based on your cursor and you can’t precisely control where your cursor is when you drag an object. But once the object is placed, you can see where it is fairly precisely. Often the best solution is to specify the object’s position. You may start by selecting an object on one slide and discovering its position first before using those numbers for a similar object on a second slide. Select the first object and click the Format tab. In the Size group, click the Size and Position arrow to the right of the group’s name. In PowerPoint 2013, this opens the Format Shape taskpane. Click the Size and Properties icon–it looks like a square with measurements. Below the size settings, click the Position heading to expand the settings. In PowerPoint 2007 and 2010, this opens the Format Shape dialog box. Click the Position category (2010) or tab (2007). 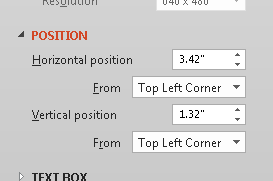 By default, you measure from the top-left corner, but if you want, choose Center in the From drop-down list. Write down the horizontal and vertical measurements. On the second slide, select the object that you want to have a matching position. Again navigate to the position settings and enter the position of the first object. Press Enter to apply them and see the object move. Using this technique, you can precisely match the positions of 2 objects or simply set the position of one object. Do you need to precisely set the position of objects? Leave a comment! Good post! I often use drawing guides to set positions (edge or center) of objects. Thanks for this, Ellen. Keeping some elements in the exact place from slide to slide can add some nice effects to your presentation. I don’t find copy and paste to be 100% reliable, especially if I’m duplicating text, so I usually just duplicate the entire slide and delete what I don’t want. One additional way is to use the Change Picture option. 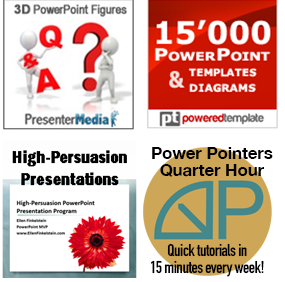 The images must have the same size outside of PowerPoint to start. Then you can layout one slide, duplicate the slide, right click the image and choose Change Picture and navigate to the new image. I use this a lot when designing different icons. Many thanks, what a great idea to use the Change Picture option! The one you stated above is absolute of no use. Hever when some one referring multiple object don’t assume that is it onlu 2 or 4, it is more that 200 or 300 Pics in each slide, it will be hard to go each slide and enter the position. Please tell me, How to put a lock position so that all object in slide will align to same place as the first one is or as per defined position. 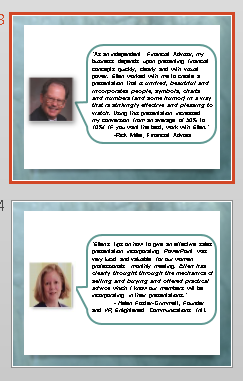 I work with a lot of Powerpoint documents whose slides are taller than the screen (9″x12″ or 11″x17″, portrait). When I paste an image from almost every non-powerpoint source, the slide jumps so that it is centered on the screen but the image is pasted in the upper left-hand location of the slide, out of site. I then have to scroll up to locate the image and drag it to the desired location. The only exception I am aware of is that when I insert an image from Coreldraw, powerpoint centers both the slide and pasted image on the screen. I may still have to scroll to place this image but at least I don’t have to hunt for it. Obviously, the applications have a way of telling powerpoint where to locate the graphic. My question is how can I do the same? Powerpoint help is of no help on this subject. Of course, you can zoom out so you can see the entire slide. What happens when you use Insert> Picture instead of pasting? Do you get a different result when you paste from a web page and when you paste from an image on your computer, using Windows Explorer (or whatever)? And what happens when you choose the Picture option when you paste? (When you paste, there’s a small “badge” next to the paste and you can click its down arrow and choose the last option, Picture. When I do this, the image ends up in the middle of the slide. No good for those of us who are using right-justify to create slide titles. With the text varying to the left, as it will with right-justify, we need to be able to position on the basis of the top-RIGHT corner of the slide, not the top-LEFT. As usual, computer geeks creating software in their caves have no inkling at all as to how the outside world works with their products. It’s true that you can’t position from the upper right, at least in English, but if you’re using a text placeholder that’s the same on every slide, setting the upper left position on the slide master will give you consistency of placement, even if the text is right-justified. Not sure what you mean by “text placeholder,” but I’m using a Title text box – the one that comes with most default slide layouts. Yes, it’s nice if I know that I will be using the same layout for the entire slide presentation, but in many cases, I’ll run into an issue deep into the presentation that forces me to change the positioning of some of the Title text boxes. Now, I’m stuck because I would like to reposition the rest of the Title boxes, but I can’t. Yes, the Title text box is a “placeholder.” If you want, you can make the suggestion to Microsoft at https://powerpoint.uservoice.com/. In the past when I used copy/paste, the selection would show up on a new slide in the same position, but it no longer does and I spend time adjusting it now. I cannot find any related setting. Is there an option I need to (re)set? Copying and pasting to a new slide still puts the object at the same position for me. This happens within a presentation? If one presentation is standard width and the destination one is widescreen, I can see that happening. Thank you for your response. Yes, this happens within the presentation while I am creating it. It is strange because I have been doing this for years and only changed recently. The slide to slide alignment helps to keep text in the same position for sequential slides. I am at wit’s end. 2) use slide layouts instead of text boxes. You can create custom layouts that should help. Using the Format Shape/Position dialogue box, horizontal/vertical from Top Left Corner inputs: All Input Objects should reference the same exact point if lined up on top of each other. However, I find that a Line, Box 1 and Box 2 each using different positioning points. Very baffling. Anyone else having the same problem and know of a solution? Thanks. Are you saying that the ‘outline’ of an object defines the position, rather than the object itself? How does PP generate the ‘outline’ and can I make it ‘fit’ tighter to the object?